The state of the art Transit Bus Wash Systems from Westmatic are a great solution for cleaning your bus fleet and motorcoach vehicles. Our drive-through wash systems stand apart from the competition because of their incredibly compact design, reduced water use and unsurpassed versatility. 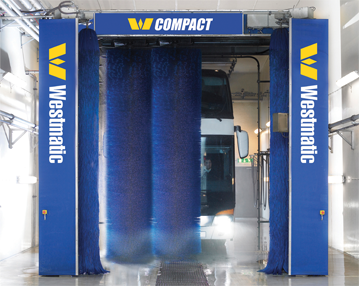 With the compact design of our Transit Bus Wash, Westmatic can often reduce wash bay space requirements, therefore reducing new build costs! The full density brushes combined with high-pressure spray arches provide the safest, most efficient wash.
Our systems are capable of moving into the center of the wash bay and clean with an overlapping brush movement. The brushes are also capable of washing not only the sides but the front and rear of the vehicle too. Westmatic's bus wash systems use less water, chemical and electricity compared to traditional systems on the market. The Westmatic System will make it so much easier for you to wash and clean your fleet with a single machine. When you have a fleet of buses, you need to keep them clean. Fleet Washing allows you to clean your fleet quickly and efficiently, and make a great impression with a clean vehicle. With all of their technology and sophistication, Westmatic's wash equipment remains very simple to operate and maintain. Westmatic's Transit Bus Washing Systems requires less than 30 minutes of preventative maintenance and mechanical adjustments a month! Our systems are very easy to customize for different vehicle types and sizes. If you would like to receive more information on our Large Vehicle Wash Systems, please call or click to contact Westmatic today.